From the Marigny to Metairie, the Big Easy remains one of the most fun, interesting and exciting destinations in the world. Dine at world-famous restaurants, party on Bourbon Street, experience the history of the French Quarter and be awed by nature on a tour of Hurricane Katrina affected areas. New Orleans is proud of its well-known nickname, "The Big Easy", because it so aptly describes the relaxed, hospitable attitude of this lovely city, steeped in history and intertwining cultures. New Orleans is known throughout the world as a city where hospitality never ends! Get the scoop on safe, cultural and comfy places to stay during your visit, whether it be in the French Quarter, Uptown New Orleans, a residence near Bourbon Street, or something off the historical beaten path. The following New Orleans Bed and Breakfasts are the best New Orleans has to offer! Block-Keller House - New Orleans, LA – A New Orleans bed and breakfast inn like no other, the Block-Keller House offers easy streetcar access to the attractions and events of New Orleans, Louisana. 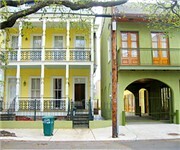 Plan the perfect New Orleans B&B getaway vacation to our laid-back New Orleans inn located on Canal Street. Offering nine bed and breakfast guestroom accommodations and a gourmet breakfast buffet, the Block-Keller house is your home away from home in New Orleans, LA. Hop on a streetcar and ride to the French Quarter, the Garden District, City Park and all the other wonderful Louisiana activities. Rooms feature antique furniture and collectibles from around the globe. Two furry mascots, our dogs Buster and Milo can stand in for your pooch back home. Maison Perrier - New Orleans, LA – Situated in the Uptown/Garden District area of New Orleans, Maison Perrier is a casually elegant reminder of times gone by. Ornamental woodwork, wonderful antiques, delicate chandeliers, and of course, Southern hospitality welcome you to our exquisite bed and breakfast. Maison Perrier is perfect for weddings, company retreats, family gatherings or quick getaways. Built in 1892, this Victorian mansion is registered as a historic place by the U.S. Department of the Interior. Maison Perrier today features spacious bedrooms and luxurious bathrooms. Creole Gardens Guesthouse Bed and Breakfast - New Orleans, LA – Our New Orleans Bed and Breakfast is your hotel of choice when in search of a place to stay right in the heart of New Orleans! Our reputation for being as unique as the city itself, has made our Bed and Breakfast a favorite destination for locals and travelers alike and we invite you to be a part of the excitement. From authentic New Orleans weddings, to fun weekend getaways, the Creole Gardens offers you the exciting upbeat atmosphere that highlights everything New Orleans has to offer. Sleep like a log in one of our three different style of rooms at our Bed and Breakfast, then step out after a full southern breakfast -- get up early and stay up late because there is so much to see and do here. Fairchild House Bed and Breakfast - New Orleans, LA – Situated among the picturesque oaks of the Lower Garden District of New Orleans, the Bed and Breakfast is located seventeen blocks from the French Quarter and twelve blocks from the Convention Center. 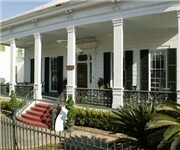 Magnolia Mansion - New Orleans, LA – Magnolia Mansion is the perfect New Orleans B & B accommodations for those seeking a peaceful Romantic Getaway to celebrate any special occasion such as an anniversary, engagement, honeymoon, elopement, proposal, birthday, or a quiet weekend away from the children. This B&B is centrally located uptown and considered to be "The Gateway To The Garden District", It is just one block from the St. Charles Streetcar, and within minutes of the French Quarter, five star restaurants such as Commander's Palace and Emeril's Delmonicos , the Convention Center, our beloved Cemeteries, the Mississippi River Paddlewheels, Major Attractions, the Superdome and Shopping. Dauphine House - New Orleans, LA – Dauphine House was built in 1860, when New Orleans, LA was the largest city in the South, enjoying prosperity and growth on the eve of the Civil War. Guest rooms offer 12-foot ceilings and hardwood floors, and each has a private bath, small refrigerator, microwave, cable TV, telephone, and coffee maker. A breakfast basket of fresh fruit, muffins, juice and chicory coffee is provided in-room each morning. The Dauphine House is located in the historic Faubourg Marigny, just one block from the French Quarter (near Bourbon Street and Esplanade Avenue), and two blocks from Frenchmen Street, a locals’ favorite for food, music and culture. Guests are within walking distance of world-renowned Louisiana restaurants, jazz and zydeco music, and other New Orleans attractions. Sully Mansion Bed & Breakfast Inn - New Orleans, LA – Sully Mansion in the heart of the historic New Orleans Garden District, surrounded by stately homes, grand oak trees, walled gardens and soft southern breezes. The house was featured in The Curious Case Of Benjamin Buttons with Brad Pitt. Just one block away from St. Charles Avenue and its famed streetcar, you will have easy access to all of New Orleans' attractions and enjoy the Southern hospitality of innkeepers who are happy to help you make the most of your stay. 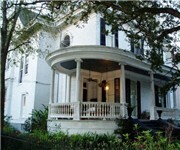 The Sully Mansion Bed and Breakfast is the only licensed bed and breakfast in the New Orleans' Garden District. Surrounded by magnolias and live oaks, the neighborhood is filled with Greek revival mansions and nineteenth century villas. Our guest are just steps away by streetcar from the French Quarter, Central Business District, Loyola and Tulane Universities, Audubon Park, the shops and boutiques of Magazine Street, world-famous restaurants and music clubs. Grand Victorian Bed & Breakfast - New Orleans, LA – Experience the Grand Victorian, designed and built in 1893 by famed New Orleans architect Thomas Sully. Lovingly brought back to its former glory and decorated with period furnishing, the Grand Victorian welcomes you to a majestic past within the comfort and convenience of a modern bed and breakfast establishment. The Grand Victorian was recently awarded the honor of being selected as the "2007 Best B&B in New Orleans" by Citysearch! In additions, the hotel is recognized by the Historic District Landmark Commission of New Orleans and the Louisiana Preservation Alliance, and has been seen on the TRAVEL CHANNEL, "Mardi Gras, 2001 & 2002" and also in Southern Living Magazine. B&W Courtyards Bed and Breakfast - New Orleans, LA – The Courtyards Bed & Breakfast, located adjacent to the historic French Quarter in the Faubourg Marigny, offers a taste of old New Orleans with a Caribbean twist. The Bed & Breakfast is a collection of three 19th century buildings connected by courtyards. All rooms have been decorated with meticulous detail. Ashton's Bed and Breakfast - New Orleans, LA – Just nine blocks from the world-famous French Quarter, this stunning Greek Revival 1860's mansion is located on historic Esplanade Avenue, sheltered under ancient oaks. The home has been lovingly restored with attention to historic preservation, while providing modern conveniences for guests. This center-hall Greek Revival mansion, which expands 10,000 square feet across the grounds, was built in 1861 for A. B. Charpantier, just before the outbreak of the Civil War. Lush greenery and an arched wrought-iron gate welcome you onto the wide front veranda – a great place to enjoy a cocktail or cigar. Edgar Degas House - New Orleans, LA – New Orleans' Home to the French Impressionist Master Edgar Degas, the “Degas House Historic Home, Courtyard & Inn” is a masterpiece of history and hospitality. It is the only home or studio of Degas anywhere in the world that is open to the public, beautifully restored and located on majestic Esplanade Avenue just eleven blocks from the famous French quarter the home keeps the spirit of the Degas alive. The Degas House is located at 2306 Esplanade Avenue, just minutes from the French Quarter in the historic and beautiful Esplanade Ridge neighborhood of New Orleans, Louisiana. It is also conveniently located minutes from the Convention Center, Arts District, New Orleans Museum of Art and the Fairgrounds. 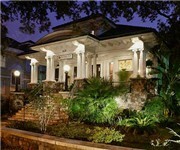 Annabelle's House Bed and Breakfast - New Orleans, LA – This New Orleans property is near Riverwalk, George Washington Cable House, and Superdome. Another attraction in the area includes Loyola University New Orleans. Annabelle's House Bed and Breakfast offers 7 guestrooms. Furnishings include fireplaces and desks. Guestrooms have refrigerators, microwaves, and coffee/tea makers. Avenue Inn Bed and Breakfast - New Orleans, LA – Nestled among the centuries old oaks on the famed St. Charles Avenue Streetcar line, this 1891 Thomas Sully mansion New Orleans lodging offers turn-of-the-century charm to match its historic location. From the heart of the Uptown/Garden District, guests need only minutes to reach the New Orleans French Quarter, Central Business District, Morial Convention Center, Tulane and Loyola Universities, Riverwalk shopping, Lafayette Cemetery, the D-Day Museum, Audubon Zoo, The Aquarium of the Americas, and The Louisiana Superdome all located in New Orleans, LA. Access to these destinations is easy via the streetcar that stops at the Avenue Inn Bed and Breakfast front door and operates 24 hours a day.